Gua Pian comes from the Da Bie Mountain Range and is one of China's famous teas. During the Qing Dynasty (1644－1912), Gua Pian was a Tribute Tea to the royal court, which meant that both the processing technique — the method for crafting the tea — and its specific terroir — the region where the tea is grown — was highly documented and defined. You guessed it: the historical terroir of this tea is the city of Lu An, in the province of An Hui. Ever since the Tang Dynasty (618-907), tea from Lu An has been noted by tea connoisseurs and has appeared in numerous poems and novels. The mythical story of the origin of Gua Pian tea involves a divine spirit giving a villager a tea tree that stood in front of a bat cave in Qi Shan, so sometimes Gua Pian connoisseurs will use the phrase "bat cave" refer to the tea to emphasize its legitimacy. Where is Gua Pian From? Like any historical terroir, the division of the Gua Pian producing region is strict and clear, it is divided into the Inner Mountain and Outer Mountain areas. The outer mountain consist of northeastern district within 5km diameter of Yu An and Shi Po Dian, closer to the city of Lu An. The Inner Mountain (better) is deeper into the Da Bie Mountain Range including areas of Xiang Hong Dian and Xian Hua Ling, with Qi Shan crowned the best of them all. The mythical story of the origin of Gua Pian tea involve a divine spirit giving the villager the tea tree around a bat cave in Qi Shan, therefore sometimes Gua Pian connoisseurs like to throw around the word bat cave to emphasize the legitimacy of the tea. To reach the Qi Shan area from Xian Hua Ling where the main Gua Pian primary trading market is, one has to take a very old ferry across the Xiang Hong Dian reservoir, making it one of the most tedious to reach but stunningly beautiful tea regions because the ferry only runs once a day and with no set departure time. Gua Pian tea is unique not only because of its history, but also because its unusual picking style and processing technique. Gua Pian is the only Chinese green tea that uses only leaves without any buds or stems. How is Gua Pian made? Now a lot of the knock-off Gua Pian uses the left over leaves after all the buds were picked. However, in the region where Gua Pian is the primary tea, people would purposefully wait for the bud to open up and become leaves before picking the tea. Because of this, Gua Pian is one of the latest picking green teas with the primary season usually happen around mid to end of April. After the leaves are picked in the morning, they are usually spread out in a shaded area indoors to let the surface moisture of the leaves dry out for a few hours and the official making starts after sunset. 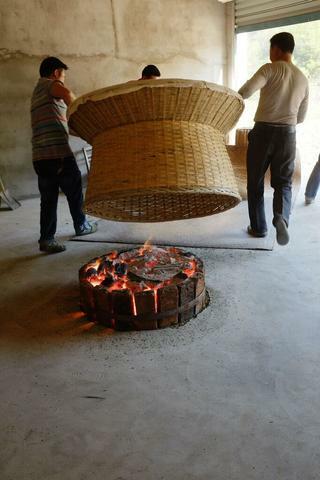 The Gua Pian woks are wood fired and are usually in a standup position with two or three line up in a row. Without a dial to control the temperature, one person has to be assigned to man the log fire, controlling the temperature completely by skillfully positioning the logs and know when to add or take out a few. The two or three woks are usually operating at different temperatures with the first one the hottest. Once the leaves are thoroughly cooked (enzymes killed), they are transferred to the next wok(s) to make shape. The tea makers use a small broom or swatter looking tool to move the leaves then gently beat it continuously to make sure the leaves are heated evenly and takes on the signature tightening shape, making about half an ounce of tea at a time. The leaves then are transferred to a slightly warped bamboo tray and moved nimbly over a dim charcoal ash to slowly bake dry. After the teas are baked dry come the most tedious step of all top shelf Chinese teas, where one by one the older leaves and stems are picked out from the batch. Afterward come the most unique steps of Gua Pian, La Da Huo, or pulling the big fire. 20lbs at a time, the semi-dried leaves are put on a giant bamboo tray with one man on each side of it and literarily walk the tea over a sizzling big pit of charcoal fire to flash roast the teas. For each batch of tea, this step is repeated for about an hour. It is usually done on a three-man rotation as the locals say no stronger man can handle more than 5 rounds of the roasting a day. The tealeaves loose about 30% more moisture after this step, leaving us with only around 14lbs of the final tea. Like all tea regions throughout the world, many scientific efforts go into developing more economically viable cultivars and stabilize them through cloning with saplings. Historical mountain teas usually are late adaptor to this modernization but are not totally absolved of the practice. Though majority of the Gua Pian in the market are machine processed using the new cultivar, there are still a lot of the old tea trees in the region of a varietal what the locals call Ben Cha, or stupid tea. Because these tea trees were planted by ancestors and with seeds, so it is not of a single stabilized varietal but a collection of varieties and that is what gives the made tea unrivaled complexity. You can purchase it youself to buy at our online store.If you want to learn more about Gua Pian check out our video page for Shunan's travel footage or Koen Cohens interview with Shunan on his podcast, Talking Tea. Gua Pian’s general profile is grassy, toasted, and slightly savory, with a sugary body and mouthfeel (but not actual taste). Due to its unique picking style — Gua Pian uses only full leaves, no buds or stems — generally the second round of picking, rather than the first, includes the leaf from the head bud (since the head bud usually needs more time to develop). Though the first pluck is always the most expensive due to its rarity and market desirability, there is consensus among Gua Pian connoisseurs that the second round of picking, which includes the leaf of the first bud, tastes better. The earlier the picking time, the more tender the taste. With picking times later in the season, the taste becomes more substantial and the mouth feel rougher. By the time it reaches mid spring, the tea usually becomes a little more astringent, with quite a kick. However, no decent tea should be unpleasantly bitter. Because (in theory) all the enzymes are killed in green tea during the heat treatment, this is a tea best consumed fresh, usually within the year it is harvested. From the 2ndyear on, value of a tea without active enzymes starts to diminish and the tea has a noticeably peppery taste to it.